Dogecoin (DOGE) is forked out of Litecoin in 2013. It is one of the major cryptocurrencies of recent times. The decentralized crypto provides the facility of peer to peer sharing maintaining complete anonymity. The predominance of Dogecoin can be felt in the online content market. This is used for payment and settlement for content creators on the online media platform. The coin has popular internet meme “Doge”- a Shiba Inu dog on its logo. The coin aimed to create major crypto for online content. Dogecoin (DOGE) has a market cap of 343,788,912 USD on 15th April at 03:44 UTC. The value of each coin in terms of USD and BTC are 0.002887 USD and 0.00000056 BTC respectively. The 24 h volume stands at 31,948,758 USD at the same UTC. Dogecoin (DOGE) is the 26th largest coin in the market, and it has a 417.11 % ROI (Return on Investment). The total coins in circulation stand at 119,086,064,161 DOGE. 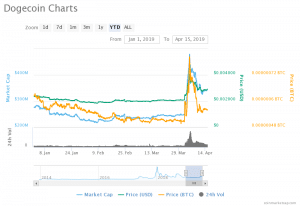 Dogecoin (DOGE) has been one of the few coins which have shown stable growth in 2019 just after crypto winter. The change in the last 90 days was minuscule. But, along with the whole market, the indices rose to new heights after April 1st. On April 4th, it reached as high as 0.003881 USD. But, it could not sustain the momentum and started to experience a fall. By comparing the figures of 15th March, we can see the gradient change in the value. 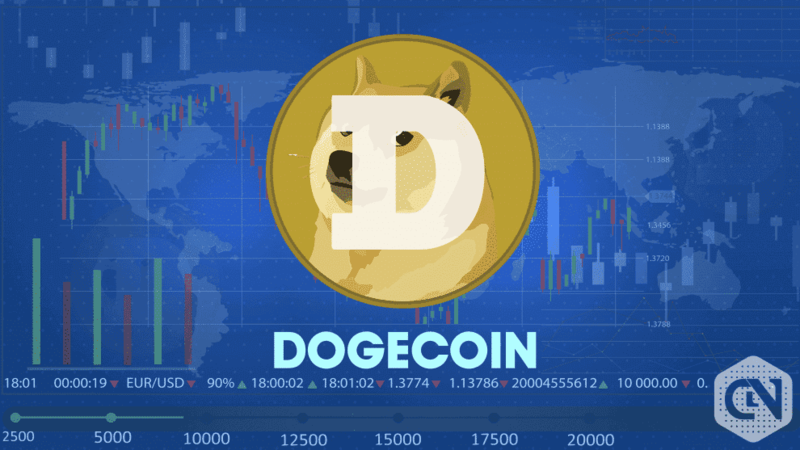 The market cap of Dogecoin (DOGE) on 15th March was 241,811,301 USD. The value of each coin in terms of USD and BTC were 0.002038 USD and 0.00000052 BTC respectively. The current market cap is 42.17 % more than the market cap of 15th March. The value in USD also has inflated by 41.65 % in the last 30 days. After facing resistance at 0.0038, the coin experienced a fall. But as of now, the growth has been stabilized. It has made a perfect place for the short term buyers to make a purchase call. And the medium-term holders, as well as long term holders, can aim for anything below 0.003 USD. In the next few weeks, the value will rise with resistance at 0.004 USD. The long term holders can be benefitted with a huge dividend by the end of 2009 with more than 150 % profit.